I n Izmir Turkish citizens from Macedonia are a bridge between the two countries and peoples. The house of the Holy Mother of God is an important spiritual temple which arouses a feeling of excitement and peace. It was the morning of a warm and pleasant day when the Sun had just risen over the Asian part of Istanbul, and the plane had taken off for the East, towards Izmir. We continued our flight on the iron bird (“Boeing 747”) of Turkish Airlines. In less than an hour we were in the three-and-a-half million city of Izmir. This metropolis is situated in the bay that bears its name and spans over its lowlands and the surrounding hills. We were met there, and welcomed by the people’s representative in the Parliament of the Republic of Turkey, Mr. Kemal Vatan, born in the village of Zleovo, near Radovish, Dr. Melih Inan, the Director of the Airport, and other Turkish citizens of Macedonian origin. It appears as though the regions of Dolna Reka, Veles and other regions of Macedonia have moved to Izmir and its surroundings. There are large numbers of these Turkish citizens from Macedonia, amongst which the greatest in number are the Macedonian Muslims. There are more of them in Turkey than there are in Macedonia. This is what we were told by our hosts because according to their unofficial statistics, there are from 300 to 500 thousand Turkish citizens from Macedonia living only in Izmir and the surrounding cities. There are people from Vranovtsi and Orizari, near Veles, from Skudrinye, from ¦upa and Debar, from near Pehchevo, Delchevo, Shtip, and other places in Macedonia. They all have a good life in democratic Turkey, which has accepted them as honest, kind, and good-hearted people. Many of them have become famous and respected businessmen, intellectuals, doctors, shop owners, and loyal citizens of their second fatherland, Turkey. At the same time, these Turkish citizens from Macedonia love and respect Turkey, but their grandfathers’ land, Macedonia, too, which they carry in their hearts and in their souls. Our hosts from the Ministry of Labour and Social Welfare, and the Mayor of Bornova, organised a visit for us to the city of Selchuk and the ancient city of Ephesus. In Selchuk we visited the City Museum where many exhibits from Ephesus and other localities in Anadolia and the coast region are displayed. The museum is an unavoidable stop for visitors to this part of Turkey. We continued towards the well known, ancient treasury of Ephesus, situated less than 200 kilometres south of Izmir, 20 kilometres north of the summer resort, Kushadasi. 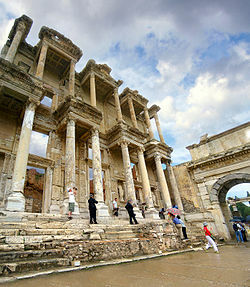 Ephesus, the famous city of the past and the present, is situated at the foot of Mt. Bilbil, Koressos, where the Kaister river enters the Aegean Sea, and on the lowland region near the sea. This significant ancient city is first mentioned in the middle of the 7th century BC. Ever since its foundation it has played an important role in the Anadolian region. Because of this, it was often attacked and conquered. It was under Persian, Spartan rule. In 334 Alexander of Macedon conquered the city and the strategic military area surrounding the city of Ephesus. Ephesus was under authority of the Roman Empire and was a major city of the Asian province at the time. In the meantime, at the beginning of the first millennium, Christianity began spreading in the city very quickly. However, the Romans opposed Apostle Paul’s doctrines. This was confirmed by the residents of Ephesus, who demonstrated under threat against the spread of Christianity, gathering in the largest theatre in the city in order to express their anger against the “new” religion. However, according to many, Ephesus was God’s chosen place, where the Holy God Mother and St. John spent the last days of their life. Namely, the house of the Holy Mother of God is found very close to Ephesus, on the western side of Mt. Bilbil. The Church of St. John, one of the composers of the Bible, reaches high over the present-day city. At the same time, one of the seven churches in Asia, where St. John found his inspiration for religion, was in Ephesus. The history of Ephesus records that, in AD 262, the Gothic destroyed the city together with the Temple of Artemis. The city never again regained its previous state of magnificent growth and development. It is also very significant for Ephesus that in AD 431 the Third ecumenical Council was held in the house of the Holy Mother of God. This council accepted the Holy Mother of God as Mother of God Jesus Christ. During our visit to Ephesus we saw numerous structures and objects from the long history of this significant ancient locality. We visited the remains of the Temple of Artemis, Trayan’s Fountain, the Marble Road, the Stadium, and other structures. However, the visitor is especially impressed by the great theatre, it being an exceptional experience. It is situated in a recess of the western side of the hill. Its size, expanse and magnificence gives one the feeling, and takes him in his thoughts many centuries far from the present. We were told here that in recent years Luciano Pavarotti, Julio Iglesias, and many other world famous artists presented their artistic qualities there before several thousand guests at this theatre. The area attracts with its beauty and scenery, while the church represents a place where thousands of Christians and Muslims come to bow and to pray. It appears that this year the church will be most visited on 15 August, when the largest gathering to celebrate the third millennium of Christianity will be held. On this occasion thousands of believers, Christians, Muslims, and others are expected to visit the house of the Holy Mother of God. According to written documents we know that St. John brought the Holy Mother of God to Ephesus during the fourth or fifth year, immediately after the crucifixion of Jesus Christ. The house on Mt. Bilbil, planned and constructed by St. John, is at 420m above sea level. According to the tales the house was discovered by the German nun, Anna Katerina Emerich, who devoted her entire life to God. She was paralised and made spiritual connection with the Holy Mother of God. The documents claim that, while in a trance, she had a vision that the Holy Mother of God was buried somewhere near the church. This was confirmed by some Lazarian priests, who in 1891 discovered the location of the house where the Holy Mother of God spent the last days of her life. Thus, it was discovered that the cross-shaped building and dome were ruined, but were later restored. During our visit to the house of the Holy Mother of God we were familiarised with many details relating to the discovery of the temple, as well as the visits and respect of both Christians and Muslims towards this spiritual centre. The large statue in the garden of the church giving one the feeling that the Holy Mother of God welcomes guests and those of good intent with widespread arms, leaves one with a special impression. On the other hand, the statue of the Holy Mother of God found in the apse was erected about a hundred years ago and represents a magnificent structure before which everyone bows and pays respect to the Mother of Jesus Christ. During the evening hours we returned to Izmir where we stayed at the exclusive hotel of “Ephesus” situated in the centre of the city and is of a high category. 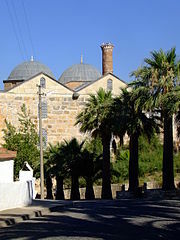 The city, though, whose Turkish name is Izmir, is also known by the name of Smirna. It is a major seaport in Asia Minor, on the coast of the Aegean Sea, and is the third largest city in Turkey. Smirna is an old Ionic settlement which was renewed in the 4th century BC. During the Roman Empire and Byzantium, Izmir was one of the largest cities in Asia Minor. Its history claims that the city had been under the rule of the Tatars, who devastated it. Later it was under the rule of the Greeks, who built it and turned into Greek, and in 1922 it was freed by the Turks, headed by Kemal Ataturk. This significant seaport and strategic land location has been an important NATO base since 1952. The delegation of the the Republic of Macedonia will remember this visit to the metropolis of Izmir forever. During the first day the delegation was met by the mayor of the Bornova municipality, Mr. Chengiz Bulut, whose origins are in the village of Sirkovo, near Kavadartsi, but he was born in Izmir. With his wonderful Macedonian he captivates as a collocutor. This prominent citizen of the Bornova municipality arranged a formal dinner for the Macedonian delegation. Here we were informed that the Bornova municipality has approximately 500 thousand citizens of whom, according to some statistics, 30% are Turkish citizens from Macedonia, mainly Macedonians converted to Islam. We confirmed this during our walk by the sea where we met a large number of citizens who spoke Macedonian and were happy to stop and greet the guests from Macedonia. In addition to the prominent Turkish citizens, such as the representative in Parliament, Kemal Vatan, at the dinner we were also joined by the assistant Vali of Izmir, Mr. Ramazan Ugrandziolu. Again, our visit to Bornova municipality was a special experience for us. Here, at the Cultural Centre of this municipality an unforgettable reception was organised in honour of our delegation. Several hundred citizens anxiously awaited the guests from Macedonia. The Macedonian music orchestra was also here to greet us with songs and Macedonian folk dancing. We heard songs such as “Bitola moj roden kraj,” “Makedonijo,” “Zajdi zajdi jasno sonce,” and other famous songs and dances. One feels as though he is in ¦irovnitsa, Vranovtsi or ¦upa... The reception was attended by the Vali of the municipality, the Mayor, a number of representatives from the "Rumeli" Association, students and other prominent citizens living and working in Izmir, especially in the Bornova municipality. Also amongst them were Dr. Shaban Akarbai, sports doctor of the Turkish representation, originally from Veles, and Dr. Ismail Bairaktar, who translated from Turkish to Macedonian, and vice versa, as well as a large number of prominent Turkish citizens originally from Dolna Reka, Veles and other regions in Macedonia. After this sincere reception a platform was organised with about 200 participants from a large number of associations of Turkish citizens from the entire Balkans, and wider, who maintain good collaboration with the Bornova citizens. In our talks we dealt with issues concerning collaboration in social, cultural, and other aspects, as well as the mutual interests of the citizens of both nations and both countries, the Republic of Turkey and the Republic of Macedonia.